Are you prepared if a loved one is lost ? Are you prepared if a loved one goes missing? Owl - Once Was Lost can help you during the unwanted and unexpected event a loved one is missing or lost. 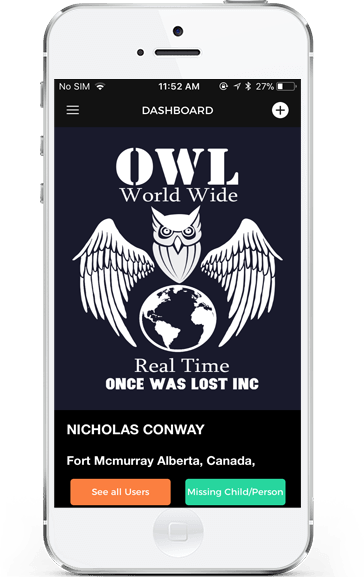 OWL is a World Wide, Real Time phone application for iOS and Android platforms. map. Chats and coordination of efforts between the "initiator" and "users" can assist it's people to recover those missing people faster than current antiquated processes. Before leaving your house on a trip anywhere; the mall, a sporting event, an amusement park or the airport. Any large area people can be separated. Take the time for that current photo opportunity, save it in the app with those descriptions, and in the worse case scenario you lose a loved one. Initiate your alert and find your lost ones. The success of OWL is dependent on its user base. Join us today and support this movement. Simply Edit your profile after your registration is complete, located in the dashboard of the app. Chat and email with other users. Communicate and coordinate searches and share information on your missing persons. This dashboard function shows all missing children/people alerts and contact for the intiator of the alert. Enter your dependents descriptive details and upload a photo. When the unwanted event arises your loved ones are missing, simply complete the relevant data and initiate your alert. Social media integrations are at the bottom of the dashboard. Watch for important info and updates. And share your thoughts and stories. View other users in real time in your area on the user map. Utilize the people around you to help search for your lost ones. Missing children and people alerts are show in the notifications tab of the dashboard. View children and people who have been found by there concerned relatives. It is the goal of OWL once possible to offer a recovery assistant program. This would provide assistance to families to help return lost person from greater distances where financially it could be difficult for them to do without support. Tell us about your experiences and opinions of this new app. Send us your feedback on the contact page below. Copyright © 2017 OWL All rights reserved.